Uttarakhand Chief Minister B.C. Khanduri tendered his resignation to Governor Margaret Alva at the Raj Bhavan in Dehradun on Wednesday evening. Governor Alva lauded Khanduri for serving people of the state with great competence and integrity. 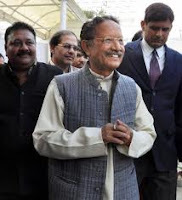 "Khanduriji was a very good chief minister, who served the state and the people. It is with great regret that I am accepting your resignation," she said. Khanduri on his part thanked Governor Alva for her guidance and support during his tenure as the chief minister. "Well, I have known the Governor for a long time. It has been my good luck that I have also been in the Parliament with her. I am not saying this just for formality. I am very grateful for the guidance and support provided by you (Governor). I will always cherish my association with you madam (Governor). It has really been a great pleasure being guided by you," he said. The verdict of Uttarakhand assembly polls has thrown up an indecisive mandate. Both Congress and the BJP are in the line to form the government in the state. Congress with 32 seats has a one-seat advantage over the BJP.